This looks and sounds delicious! “Stoup” sounds perfect. I like my beef veg soup chunky! Happy new year and continued success! It looks like real comfort food whatever you call it. Happy New Year! 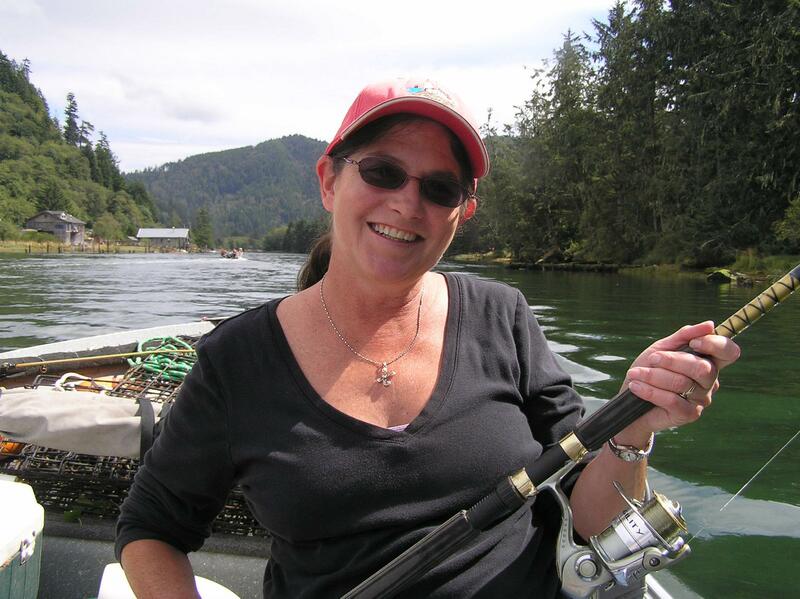 Thank you Gerlinde, Happy New Year to you and yours! Hope it’s a great one! One of my Mom’s winter mainstays! We had a kerosene stove in the kitchen and she would slow cook the soup all day – wonderful aroma filling the house! It does smell lovely, doesn’t it? 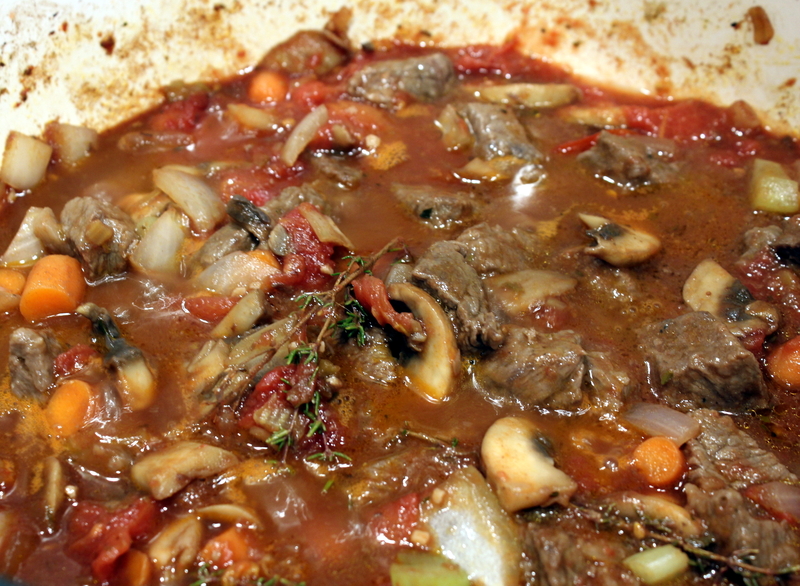 I didn’t quite have all day to make this so choose a quick-cooking beef. Thank you Noelle! That looks great and I’ve got a pound of leftover roast beef in the freezer waiting for something like this! Wow, what a win for you!! Thanks and enjoy Mad Dog! This recipe looks and sounds wonderful — a real “stick to the ribs” meal for me. I just printed it out and now I’m gonna share this with my friends on FB. Thanks so much for sharing. Thank you so much, I appreciate your comments and share! I do hope you enjoy it, me and my family sure did! First, this looks divine. Absolutely rib-sticking. Bookmarked. — Secondly, a quarter cow is about how much meat? How big does my freezer need to be for that much? I have a friend who breeds grass-fed (mostly prime-grade) organic beef. How much do I need to order? Wow, thanks Adam!! We get about 170 pounds or so from the cows we’ve bought, this is our fourth one I think. Figure about two standard camp cooler’s worth. And ALWAYS ask for the beef/soup/dog bones, whatever they end up calling them. Great for making stock and of course you get the yummy marrow. A quarter cow has always been plenty for our family of three, which is now down to two with our kiddo off to college. We ended up with about 20 pounds left this year before this year’s cow, but our daughter has been gone since August and my temp night shift job precluded cooking much of it the past month or so. I say start with a quarter cow this year and see how it goes! 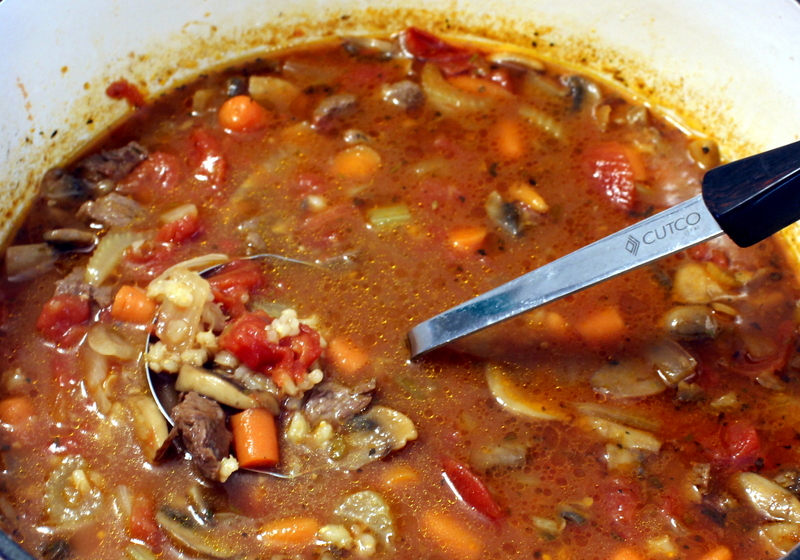 I just finished eating the last of my beef barley soup. The barley does continue to expand as I mentioned in my post and I had to add almost 16 oz. more liquid – no stoup for me! Great soup for this cold weather. Yes, it sure is! Thanks Judi! Oh I wish I had some right now. Grandma used to make beef barley soup but i never have. I need to change that. I love soup but hubby not so much darn it! A perfect winter dish! Btw, please revisit my last post. The video is now available. I mistakenly had the post published before the video. I intended to publish tomorrow! Thanks so much Gina! And Happy New Year! Beef and barley. Made for each other, and your take looks delicious, especially for a cold winter night. Happy New Year. Happy New Year to you too Darryl! Ohmygosh, I am SO craving this now!! This looks incredible!! And yes, I do make my own, but I want your beef barley, now!! I want to wish you and yours the happiest of New Years, KR!! Thanks for being a constant source of inspiration and support!! And you are my source too for new ideas! I can’t tell you how many of your recipes I print… “for later…” lol. But yes, I do end up making many of them! 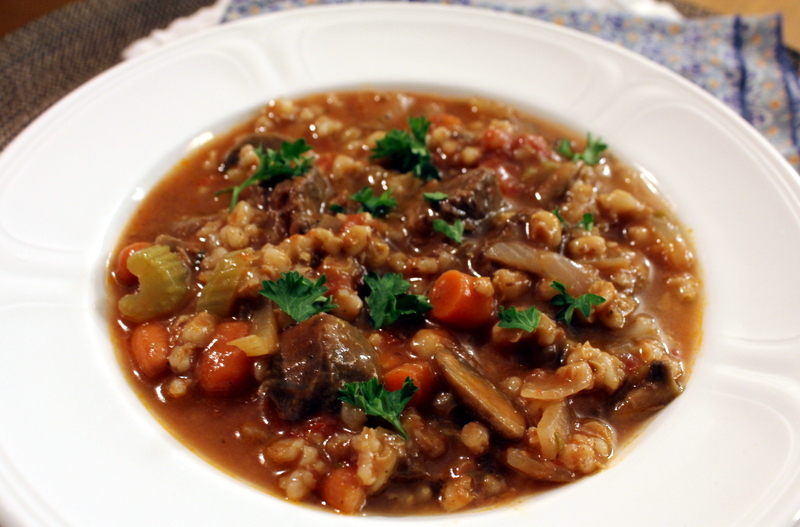 Beef Barley is one of my ALL TIME favorites! This one looks so good. I hope your new year is off to a great start. Happy 7 years of blogging! So much to celebrate. Thank you so much! So far so good, lol! Happy New Year, Kathryn! This looks and sounds so hearty, warming, and delicious. Yum! You know… I’ve never cooked with barley. While I’ve made my way to many delicious foods that were not part of my childhood, I’ve never gotten to barley. Maybe this year I’ll take that culinary adventure. 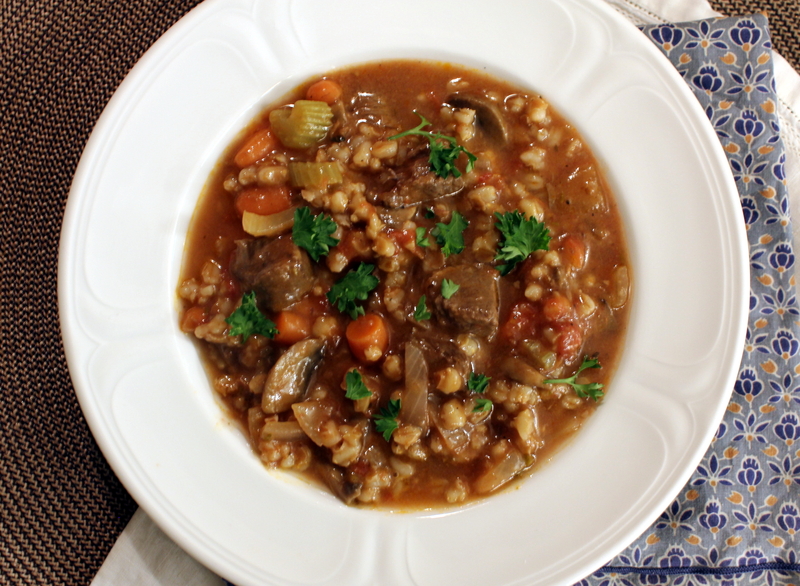 Barley is such a comforting addition to a beef stew. Try it, you’ll like it! Thanks so much, and get well soon sweetie! Yum, stoup. Ha ha. That looks so cozy and flavorful, Kathryn. Deglazing the pot with wine – now that’s my kind of cooking. Thanks for the recipe. I can’t wait to give it a try! We’ve been getting more sun than usual this time of year… thus… fog! Forget driving at night, too. It’s like a Stephen King novel. I haven’t had beef barley soup in ages and yours really looks good. Congratulations on all your years of blogging. I’m looking forward to what you will be sharing with us this year.